ASHLAND — Today, November 1, Massachusetts Lieutenant Governor Karyn Polito joined Ashland Town Manager Michael Herbert, Senate President Karen Spilka and other local and state officials to announce a $3 million MassWorks Infrastructure Program grant for improvements to Main Street and Front Street, building on Ashland’s downtown revitalization effort. The MassWorks funds will reconstruct about 3,000 linear feet of roadway along Main Street and Front Street and activate overlapping development downtown. The current upgrades include sidewalk widening, the addition of bike lanes and the burying of existing utilities. These improvements will also increase access for residential and commercial developments planned for the downtown area. Attending the announcement was Senate President Karen Spilka, Ashland Town Manager Michael Herbert, three Ashland Selectmen, Rep. Jack Patrick Lewis, Economic Development Director Beth reynolds, Ashland Town Hall staff, numerous businesses, and residents.SOURCE will have a full report with more video and a slideshow soon.- Susan. This project leverages $6.8 million in local funding and builds on Ashland’s work to revitalize its downtown with enhancements such as the Riverwalk Trail and The Corner Spot. About $3.8 million in planned developments will generate 13 new housing units, 2,000 square feet of mixed-use commercial space and the rehabilitation of an existing brewery, tap room and café. The downtown revitalization is also expected to attract about $30 million in private investment for the redevelopment of an 116,000 square-foot mill complex and former fire and police station. “For years Ashland has imagined a downtown that serves as an attractive anchor for residents, visitors, and businesses. The MassWorks program is a critical component to help us implement that vision. We thank Governor Baker and Lt. 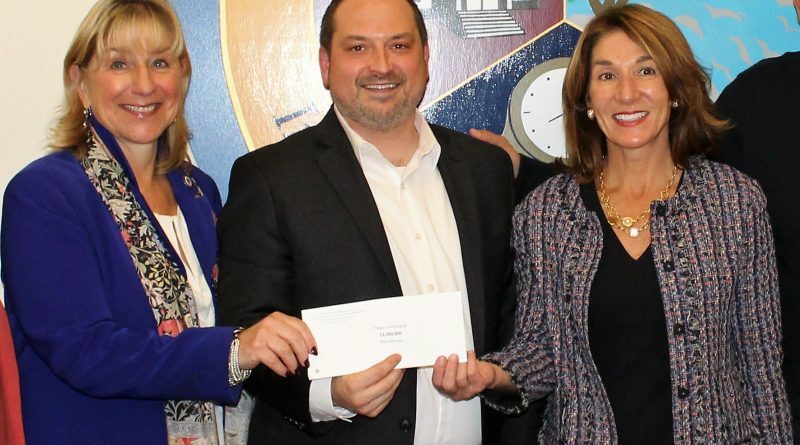 Governor Polito for their commitment to forging partnerships with both our legislative delegation and with cities and towns to help them create the communities they envision,” said Town Manager Michael Herbert. “Ashland is a growing, thriving community with dedicated local leaders committed to its ongoing success. This MassWorks Infrastructure Program grant will strengthen the town’s strong and appealing downtown, while providing necessary resources to achieve the community’s goals. I look forward to these continued partnerships to further strengthen downtown Ashland,” said Representative Jack Lewis. Since 2015, the Baker-Polito Administration has awarded over $275 million in MassWorks grants to support 138 projects in 106 communities. MassWorks funding has been critical to the addition of over 2 million square feet of commercial/retail space, approximately 10,000 full and part time jobs, more than 7,000 immediate housing units, at least 7,000 square feet of new public space and 1,200 new hotel rooms. Governor Baker signed economic development legislation in August that includes substantial new funding for municipalities, including another $250 million for MassWorks awards. The legislation builds on the Baker-Polito Administration’s work to partner with communities to catalyze economic development and create new opportunities for residents across the Commonwealth, including the 2016 Job Creation and Workforce Development act, which authorized $1 billion to support economic development efforts across the state, including $500 million authorization for MassWorks Infrastructure Program, enhanced tools and the introduction of new strategies for job-readiness efforts.